Ever since the Dior AW15 ready to wear show, I have been obsessed with Perspex heeled patent boots. Strutting down the runway in a chic rainbow of different colour combinations of lucite heels and vinyl leather was too much for this girl to handle. I wanted them all; both the ankle length and the thigh high styles. As I’m sure many others do, I like to fantasize about what I would buy if money was no object. After much deliberation, I narrowed it down to the utterly beautiful grey patent ankle boots with the pinky coloured heel, total dream boots. Every time I saw them on a celebrity, a fashion blogger, or in a magazine, I would imagine owning a pair of my own. Then, of course, the high street caught on. The lovely people at Public Desire came along and answered our Dior clad dreams with these strikingly similar boots for only £39.99, a mere fraction of the cost of Dior’s. I couldn’t believe it when I first saw them online. As with Dior, they‘re available in a selection of different colours, and if patent isn’t your thing there are also a couple of suede options too with the same incredible heel. I want them all, but as I’d already established this colour combo as being my favourite at Dior, I had to get these ones. I pre-ordered them as soon as they became available and they finally came just in time for Christmas. I seriously have still not gotten over them. I mean, look at them! When they arrived I just stared at them in awe. I shared a photo on Instagram and it went crazy, it is by far my most liked picture I’ve ever posted. They’re the best Dior dupes I have seen and I honestly couldn’t be happier with them, definitely helping me get over the January Blues so many of us suffer from. I love a statement boot, and these are the sexiest I have ever owned, but completely modern. 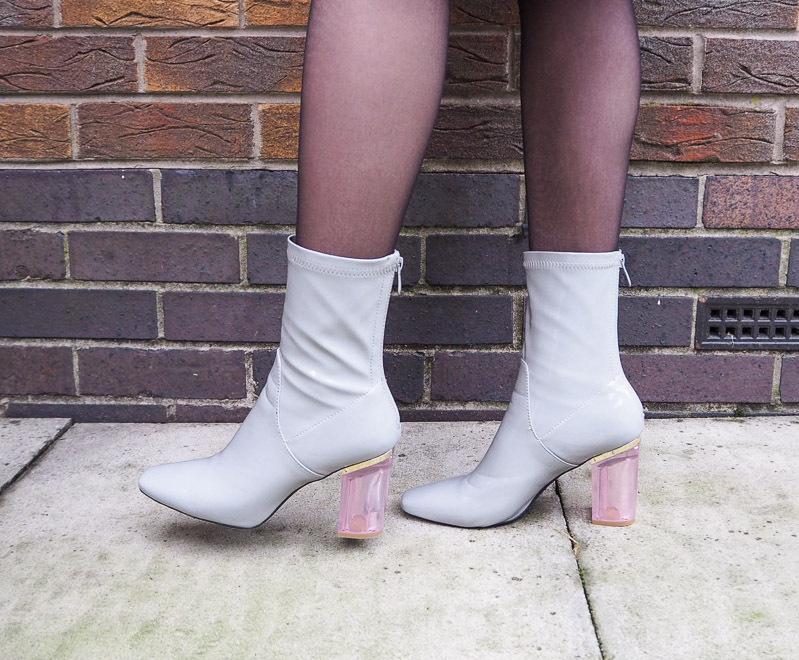 Patent boots were a trend all AW, but the contrasting Perspex heel on these makes them fresh for the new season. With their transparent pretty pink heel, they almost feel like stylish Barbie shoes, very plastic fantastic in the best possible way. I get asked a lot how the sizing is and whether or not they’re comfortable. Firstly, they run on the small side and are quite a snug fit, but they are certainly comfortable. One thing that has been made clear to me is that these boots work with any style. I can’t imagine anything I wouldn’t wear them with or a wrong way to wear them. I hadn’t foreseen their versatility. I’ve seen this same style, whether it be the actual Dior beauties or one of the high street’s versions, styled in so many different and interesting ways, and all of them have looked good. There simply isn’t a right way to wear them; it’s all down to personal choice. I’m much further towards the maximalist rather than minimalist end of the style spectrum. The dress I’m wearing here is from the latest Asos WHITE collection and encompasses another trend for Spring Summer 16: stripes. They were everywhere in the ready to wear collections, and it’s a trend that the high street always likes to adopt and usually does very well. Stripes this season are bold and graphic, and my personal favourites were the colourful ones at Prada and Jonathon Saunders. The bold stripe print on this dress was very reminiscent of the latter. I really like the stand out colour blocked pattern and colour palette used. It’s fully lined making it quite a thick material, and with the funnel neck it helps keep me warm while it’s absolutely freezing outside. I will be sure to feature these boots again with a more casual outfit so you can see how well they work with pretty much everything and anything. Whatever your personal style may be, there’s a way to wear these boots. All that’s left is to choose which colour to get and enjoy!